9:30am houseguests wake up. They’re not sure when the veto is. Mostly Chit chat.. Tom and Kato talk briefly about saying something to JOey. They decide to talk about this in more detail after they clean up. Tamar – A luxury veto .. you win trips, Money ..
LOLO – GIRL they don’t do that on Celebrity..
Tamar – sh1t yeah they do.. yes they do..
Tom – this will get you through a sticky situation ..
Tom – I don’t think the person with the power is in this..
Tamar comes up to use the HOH music. Tom goes back to play Pool with Ricky. They start speculating if Tamar has the power. 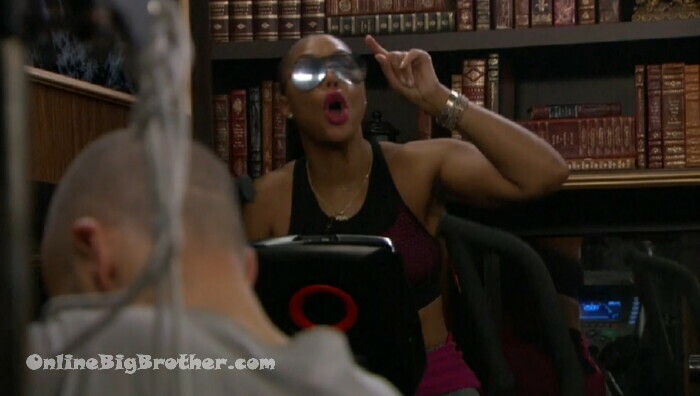 Tamar now goes on if she gets put on the block she doesn’t have the votes. Natalie – you need to calm down you’re making sh1t up in your brain..
Natalie – you should ask Tom if you are next.. what does that mean I think you know you are safe too..
Natalie thinks that’s weird of Tom to say..
Tamar is going on about being personally and physically attacked and there being no repercussions. Tom – so damn stressful..
Tom tells them he really wants to tell them something. LOLO freaks out they can’t there’s too many people outside playing pool. LOLO – Give up the alliance.. Just give up the alliance now..
Tom – Honestly at this point we’re so strong we can go out there and high five and tell everyone we’re in an alliance. Tom – I’m asking you to trust my judgment..
Tom tells her the first time he asked Ricky to be in an alliance he said no. The next day Kato won the HOH.. Ricky wasn’t being nice to me.. All of a sudden I win HOH he’s nice to me.. High Fiving..
Tom – I never wanted him to be in it at that point.. He was coming to me I had to say yes or no I said yes but it was never an official alliance. Tom – He wants to be in our alliance so he ride us to the end. Pick a side and pick of the other 2 people and ride those 2 till the end. Tom – he is our biggest threat.. I want to backdoor Ricky right now. . It’s not going to be easy. It’s a tough move then we don’t have to worry about it anymore..
LOLO points out next week they only have 3 people competing in HOH. Tom – Dina loves me Kandi and Kandi love each other..
Tom – you choose who goes out next..
LOLO – Joey is mad at me and Natalie because we sent Jon and Ryan home. LOLO – you, Joey Kato you guys talk he’s not cool with us.. He told me last night there wasn’t a good energy between us. Tom – so we’ll get rid of him ..
Tom reassures her they have the votes to protect anyone. LOLo goes on about yesterday Tom thought she was lying to him and yesterday Tom wanted her out of the group. LOLO thought they had all agreed to take in Ricky. Tom – trust me lolo..
LOLO – Tom I’m trying to trust you but I don’t have a good feeling about Joey..
LOLO was happy that Tom didn’t want to backdoor and she liked that. LOLO – for me Joey has lied to me 3 times.. He’s an actor who has the ability to say and act..
Tom – my plan to send him next.. Ricky today..
LOLO – He can split me and Nat..
Tom – I’ll show you how. LOLO – you are just thinking of yourself Tom and it’s not cool ..
LOLO – if you can tell me how you get out of that than I agree with this plan.. I would rather have the numbers one more week.. Get rid of Joey than we have all of us do what needs to be done..
LOLO – You’re a thinker Tom am I missing something? LOLO – why put me in that position if it’s not going to be easy..
Tom – I don’t think we will get the opportunity to take out Ricky for a long time.. LO says Joey has continued to disrespect the females in the house time and time again and they are not down with that. Tom – it’s so much more predictable as a group.. LO – I said Tom you do realize Joey blames us personally for sending Ryan/Jon home.. Lo – he threatened the same way he threatened Ta.. he said well it doesn’t matter even without you and Nat we have the votes.. Lo – Tom f*ed up his social game everyone is mad at tom. Nat – bring that up.. Lo – he’s not listening to me Nat.. there’s no point having a team if they’re not listening..
Nat wonders if Kato/Tom are worried they have a three with Ricky so they want to take him out. LO explains that Tom basically told her that they have the numbers with or without her. Dina walks in.. LO tells her about this “incredible bible study” she just had. R – you guys try to win it keep it the same. R – win HOH put Tom and Kato up..
Natalie says LOLO wants to blow up Tom and Kato. Ricky tells her to hold off..
Natalie agrees says they have to wait. R – we can convince him to keep it the same..
N – they (tomato) never let me and LOLO talk.. they are basically trying to say this is what you are doing..
N – this is a collaborative effort..
R – we got to at least pretend the five are still together at least until next week. Tom says it’s more important that they manage their relationship with Natalie and LOLO over trying to get rid of Ricky. 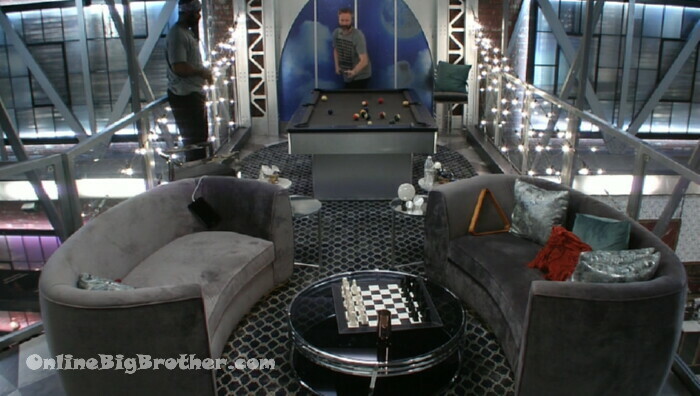 Tom – he had to also .. manage the possibility we do decide to not let Ricky out this week and we’re both in here and he’s outside playing pool..
Tom – if we walked out of here right now that would be weird..
Talking about their alliance’s plan to stick with the 5 why are they now talking about breaking it up. Joey comes in says he talked to Ricky and they’re all good. Lo says Kato and Tom threatened them. 5:20pm the Veto has started. I’m so tired of Tamar. She’s a bully. She IS a bully. I watch Braxton Family Values and have seen every episode. I love all of them but she wears me thin. She bullies her family. It’s not physical but it’s exhausting and ridiculous. That said, I LOVE LoLo; but “attacked”? As small as she is, I think LoLo could climb anyone of those guys and knock the crap out of them. She is one tough chick. Kato has spent the most time with Tom; it’s Tom’s process. He analyzes everything too death and loves to talk about everything and it stresses the girls out. I relate, because my husband loves to do the same thing even after we’ve already decided on something. I’m all about “bullet points” LOL. It wears me out to talk endlessly about things like that but Tom is harmless, just like my husband. He’s not attacking anyone. He’s just a little intense and 6’3″. Those girls could whip his behind. They are tough! Wow Tata is a ticking time bomb. I’m hoping either Joey or Kandi win veto or have the power or both.. She is gonna lose it when she goes up again..
Wow i cant believe Lolo. Two of her targets just got evicted and she’s being a big baby over the HoH wanting to get out his target. The entire alliance wanted Jon and Ryan gone, so they were the group’s targets, not just LoLo’s. So it is inaccurate to treat this like a “your target, my target” scenario. Clearly there comes a point in the game where the interests of alliance members diverge. Tom is just handling this wrong. He is on a power trip and being a dictator rather than getting team consensus. He screwed this one up big time and may have sealed his fate. Lolo just did a number on poor ole Tom. Lecturing him about loyalty after she blasts his backdoor idea to Ricky, Tamar, and Joey. WHOA! I hope big brother gets cancelled soon. such a junk show. they’re getting rid of all the guys. The guys are getting rid of the guys. So, like, Tom and Kato….Tomato? I love Kandi, too but I don’t think BB is her game. I hope she survives this week. Joey can go for my taste and the guys would be wise to give this to the girls. Right. My fave Ryan is gone. Liked Tom and kato in the beginning BUT…nope. Joey is such a kvetcher… but he’s growing on me. The guy is kinda cool in a weird way. Considering he has no idea about the game. Lolo is a very angry person. In the beginning I couldn’t understand why she didn’t have a partner. But I’m getting why not. Nat. She’s playing a good game…but being with lolo could cost her. From hero to. Zero with one HOH and a twist. Not funny…just a nervous Nellie. Say BYE to the Fun Four(5). Tom will not take it well when Nat leaves noms the same. Not much Tom can do. He can’t play next HOH. Now we see if the girls go with Ricky, tata, and MAYBE Joey. But Ricky doesn’t like Joey, and prefers the non threats like Dina, tata and Kandi. Ricky is going to align with the guys as well as lolo and nat. Only problem… for me….is I don’t like Ricki. I realize he is not cool…just cold.